Update Your Resume Now While You Still Can! Summer has just en ded but the “summer euphoria” hasn’t loosened its grip on you. While you still love that summer air, you need to start updating your documents, more importantly, your resume if you have just come out of summer without a job. It may sound harsh but, yeah, you need to update your resume and set the “summer feeling” aside. By clearly letting your time pass with an outdated resume, a lot of opportunities and time can be wasted. So, updating your resume regularly can improve your career success and speed up your job search. 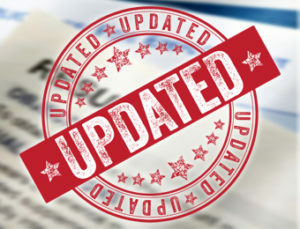 So how often do you need to update your resume? Career experts suggest that resumes must be updated every six months or every time you secure a new achievement or accomplishment. This may be a lousy thing to do, but doing lousy updating is far better than rushing things out. You had to admit that with today’s economy, stability is something farfetched. Thus, lay-offs and downsizing are nothing new. But, if you think that your company won’t get rid of you because of your “loyalty” or quality, you might have been mistaken. Downsizing nowadays is often based on your “cost” rather than your “worth” or quality. So, more often than not, quality employees are being laid-off, for one reason: they are being paid more and were considered “costly” by the company. So, have your resume updated regularly. This way, you are more prepared and ready when the big “L” hits you. Noticed those job application deadlines are always on a rush? Well, employers don’t have a lifetime to wait for that perfect candidate” that will fill in the position.” Therefore, there is always a faster application turnover for every new job opportunity. Now, if you have convinced yourself that you can do well even under pressure, suite yourself. But remember that rushing to update a century-old resume can do more damages to your resume than improvements. That said, update your resume on a regular basis. Aside from updating, always make sure that your files are in the right formats so you can easily grab the opportunities as soon as they arise. Ever caught yourself staring at the clock hoping it’s already time to leave? Well, that is a proven sign that you are already dissatisfied with the job. So before your dissatisfaction gnaws your remaining determination, better start updating your resume. Do note that attempting to restructure your resume in the midst of boredom and dissatisfaction can produce a low quality resume that definitely undersell your skills and qualifications. Of course, who wouldn’t want to show-off their achievements? Aside from giving yourself some good boost of professionalism and ability, it can also make you look proficient to an employer. Updating your resume every time you receive some good commendations can help you go into details when writing your document. It’s because there are tendencies that you will likely forget what you have done in order to get that commendation. Like anything else, resumes also show signs of aging. For one, things that are included before are now being removed. For the purpose of discussion, let us use “personal interest and hobbies” as an example. Before, these are included in resumes. Now, these opt to be removed from your resume to give room to more professional and career-based information. Aside from that, if you have subsequently gathered ample experience, let’s say 15-20 years, it is already recommended that you leave off achievements that you have gathered during your college days. You also need to remove your first job and other works that are dated beyond ten years ago. This is due to the fact that hiring managers are more interested on the things that you were able to accomplish in the last 10 years, therefore, you must focus on that time-frame. Whether your resume is asking for a total makeover or some simple tweaking, it is a good practice to have a regular update of your resume. As you know, opportunity is just around the corner waiting for the first individual who will see it coming.